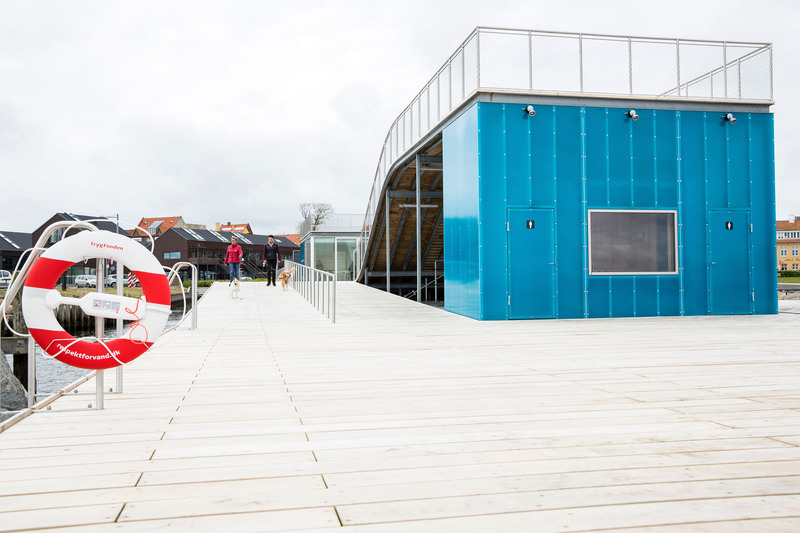 The Faaborg Harbor Bath in southern Denmark, completed in 2014, is the result of an invited competition for the municipality of Faaborg-Midtfyn designed in collaboration with a team of Danish offices. The Harbor Bath is one, among other similar, public seawater swimming basins that JDS Architects created. 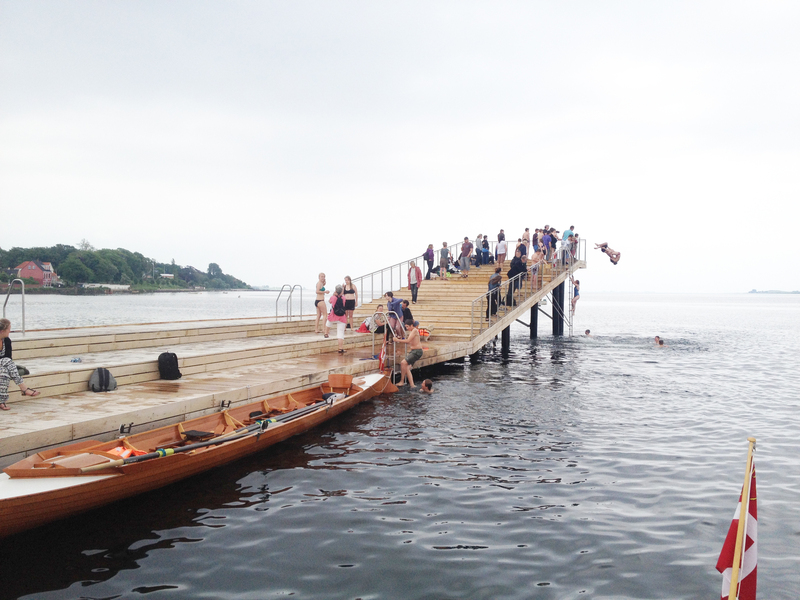 Together with architects Urban Agency and Creo Arkitekter as well as engineers Sloth Møller, they followed the general trend for leisure activities and bathing culture to reconquer cities and industrial areas. The project is an outcome of a proposal to redesign the harborfront into a social space by rethinking and recreating the outdated public space. 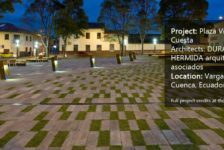 This project enabled the bathing culture to return to the city and to develop an area that was once used for industrial purposes. Image courtesy of Mette Krull. 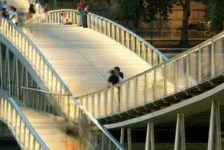 The park was designed and developed in close partnership with its users and has become a great success within the local community. Before the transition, the area had no purpose because of its unattractive appearance and missing definition of use. 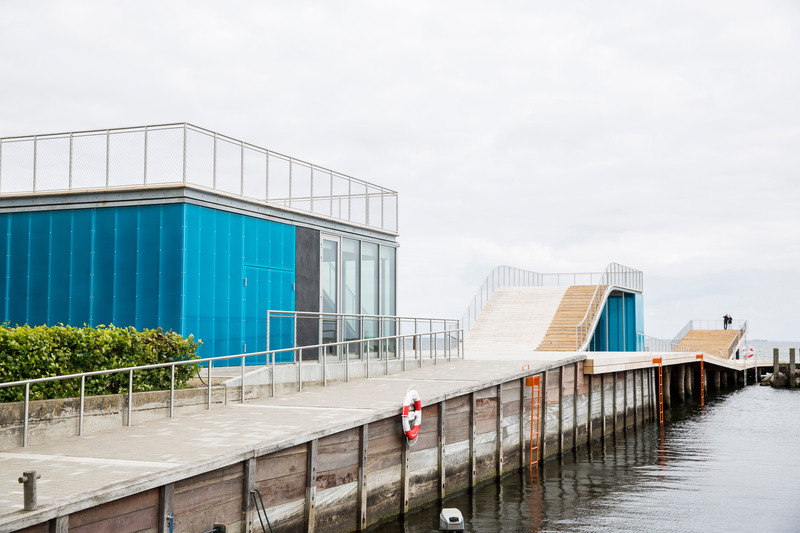 With the opening of the Harbor Bath, the public space on the water adds a new dimension of recreational activity and links the built environment and the sea. The waterfront provides the area with a new public space that encourages local residents and visitors to participate in a variety of water and other outdoor recreational activities. Image courtesy of Urban Agency. The designers’ intention was to create a framework for an unknown content, a space for public life, a place that people can adapt their own way. 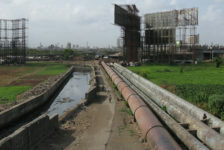 At the same time, it established a connection between the elements of wood and water. The recyclable components of the construction can be disassembled and re-used to a large extent. Wood is sourced from locally grown Danish oak trees. Other sustainable materials are also used on the site. They were chosen according to their chemical contents, effects on air, soil, water, and human health. 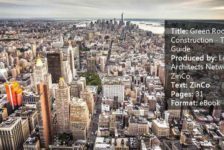 The quality of the building systems, the products and processes, as well as the total material consumption was improved due to 3D Building Information Modeling (BIM). 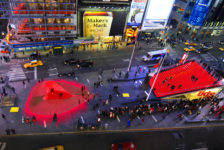 This technology enabled the design team to create an environmentally friendly project with a limited use of materials. The construction of the Harbor Bath created a “finger plan” with open basins between four bath bridges. 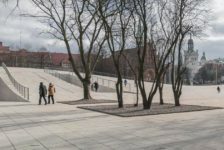 A divergence to the wooden landscape was formed due to level changes in the decking, while the gently sloping sections ensure appropriate wheelchair access. The wooden piers, which dip below and rise above the water, are carefully incorporated into the coastline of the harbor. 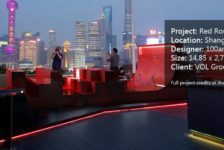 Covered with an undulating ramp that leads to a platform on the roof, the building yields panoramic views of the harbor. 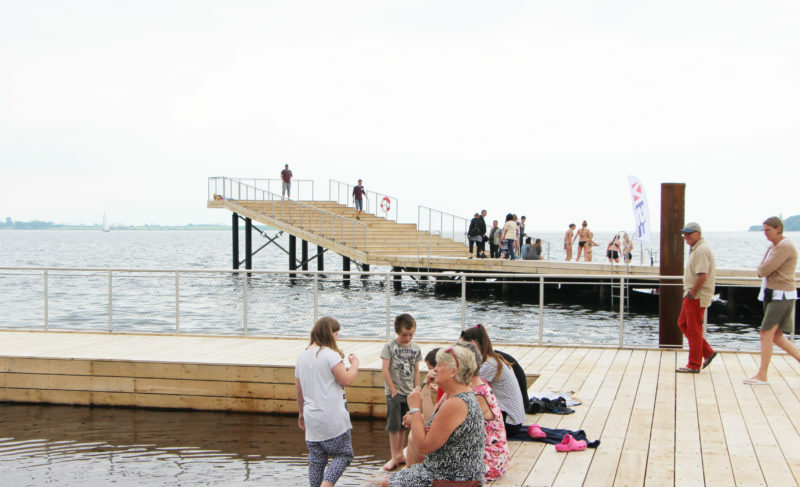 The open sea bathing area offers multiple ways to approach the water, and each pier has distinct functions. At the widest of the piers, there is a water playground that features rectangular openings, which serve as sheltered swimming and paddling areas for children. 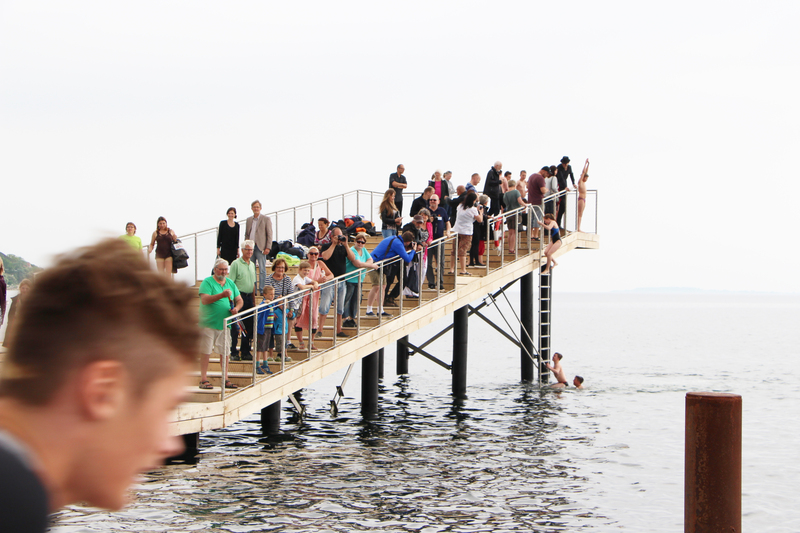 On the middle rack, the pier lifts above the water culminating at a raised diving platform and swimmers can sit and dry off on a terraced section. 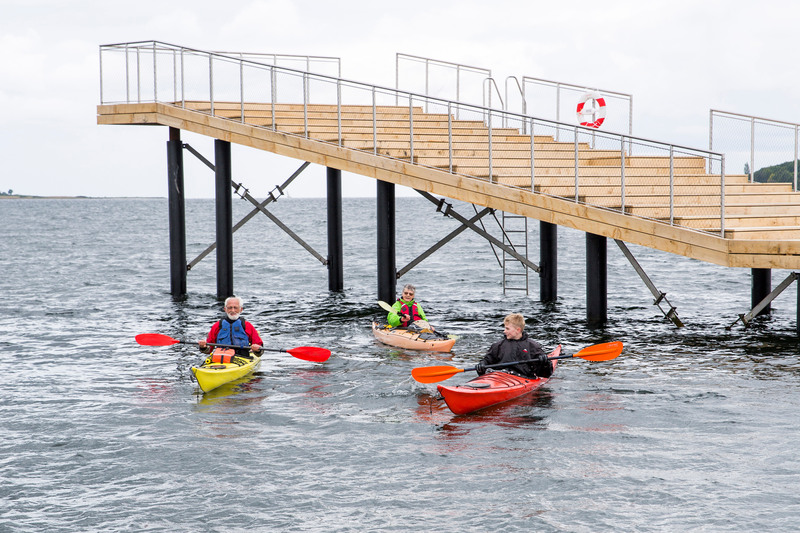 The third pier slopes gently into the water and can be used for kayaks and other water sports and provides facilities for launching and docking boats. Between the piers there are open swimming areas surrounded by the three piers with many ways of entering the water. Ladders at the piers allow the swimmers to climb in and out of the water. The big pavilion has an information center as well as facilities for storing, maintaining, and renting kayaks. 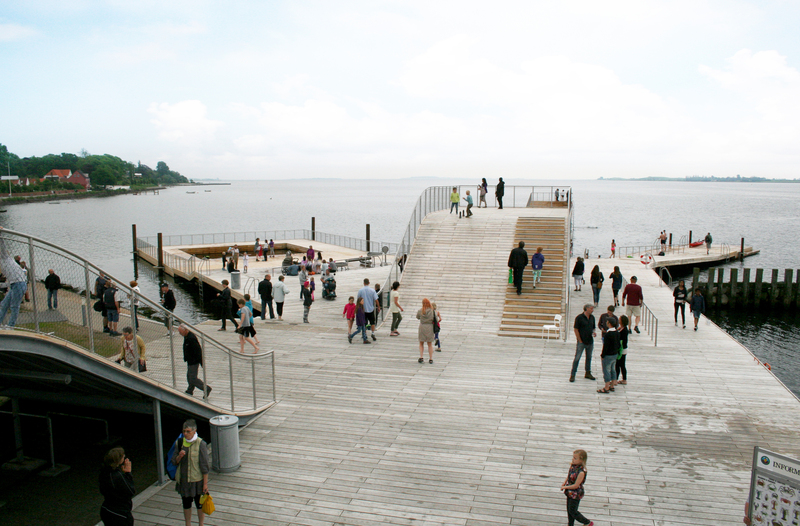 Integrated into the ramped façade of the pavilions are stepped seats to accommodate resting where people can overlook the fjord, the city, or the swimming area. The ramped smooth section can be used as a slide and the pavilion in the middle of the bath park consists of changing rooms and a sauna beneath a viewing platform. 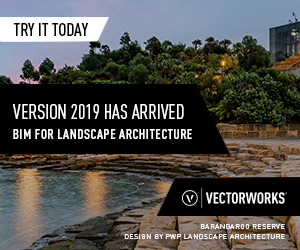 As a result, the Harbor Bath was developed with the objective of allowing all kinds of activities to coexist and to create several possibilities to experience and approach the water. Visitors can take a bath, go on a kayak tour, take a walk, or simply enjoy the sun. It offers changing rooms, a sauna, facilities for rowers, a diving platform, and a water playground. Many sport and age groups meet and share the outdoor facilities including families, sport enthusiasts, teenagers, seniors, and others. 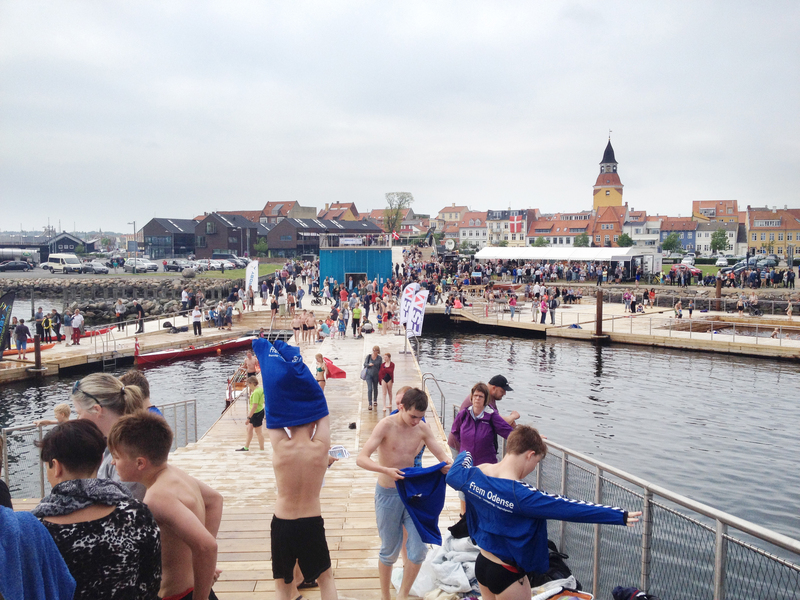 Ultimately, the Harbor Bath has become a gathering place for the city and the community and has brought new energy to southern Denmark. Anja Graner holds a BA in Landscape Architecture from the Hochschule für Technik Rapperswil, Switzerland. She is currently studying for a Master’s degree in Integrated Urbanism and Sustainable Design at Stuttgart University.